Kind of Pink and Purple: Is Sun Ra really from outer space? This week I would say I discovered Sun Ra. Sure, I have played and listened to a few of his songs, but I never really delved into his music. I never really knew how much I loved it! Sun Ra was born 100 years ago on May 22, 1914- which means that this year celebrates what would have been his 100th birthday. In celebration, I went to the NEC Jazz Orchestra's "Sun Ra Centennial" concert this past Thursday, directed by Ken Schaphorst in Jordan Hall. What struck me about this concert was how truly fun it was. The NEC Jazz Orchestra all came out in these floor length costumes, with hats to look like the clothes Sun Ra would have worn. The outrageousness of the clothes could only compliment the outrageousness of the music! For the first song, "Shadow World", the band played in the dark, the shadows I suppose, while saxophonist Allan Chase improvised. The NEC Jazz Orchestra played Shadow World, A Call for All Demons, Brainville, El is the Sound of Joy, Planet Earth, Saturn, and Enlightenment before the "Inter-planetary-mission". Here's "Saturn". I love the repeated, catchy horn lines, and head-bopping groove! Here's one of my favorites from the first half "Enlightenment". I love the happy, catchy melody, the building horn lines, and the relaxing atmosphere! The sound of some of the music was hectic and crazy- yet that was the charm. I brought my brother to this concert who has told me on multiple occasions that jazz is not his cup of tea- he likes heavy metal. Yet, I wanted to hang out with him, and I go to a lot of concerts, so we went on an adventure to hear this crazy music- and he actually loved it! I was so shocked that out of all the jazz I have shown him, he really took a liking to Sun Ra. We were laughing the entire time. I think what my brother loved was the catchiness of Sun Ra's music- among the craziness of the costumes and the overlapping parts was a strong, danceable rhythmic drive complimented by catchy, repeated melodies. Here's "El is the Sound of Joy". I love how calming, yet energetic this song is! The second half of the concert featured the songs We Travel the Spaceways, Satellites are Spinning, Love in Outer Space, Space is the Place, and Outer Spaceways Incorporated. This half of the concert was so much fun! Some of the NEC singers joined the jazz orchestra and created a danceable, fresh vibe. My brother especially loved the second half, and surprised me by flipping to the lyrics page in the program and singing along with many of the songs! I would say the best part of the entire concert was "Outer Spaceways Incorporated". The singers kept on repeating the catchy lyrics "If you find Earth boring, Just the same old same thing, Come on sign up with the Outer Spaceways Incorporated". These lyrics are pretty silly, but the way the singers sang them was in such a groove, and the rhythm section was driving in such a strong "pocket". At one point the horn players got up into the rows between the crowd and led people to the stage to dance. I looked at my brother, assuming he would want to stay seated, but surprisingly he was so into the music he got up and we both went to the stage to dance to the catchy beats. I don't think my brother and I have had that much fun in a long time. Here's my favorite "Outer Spaceways Incorporated". It is just so catchy and danceable! I think my brother's reaction to this music was amazing. I think hearing jazz on a CD is completely different from going to a concert and hearing it live. There is so much more energy and excitement when you see it live- you start to realize that those solos are happening right now in this moment, and the thrill truly gets to you. 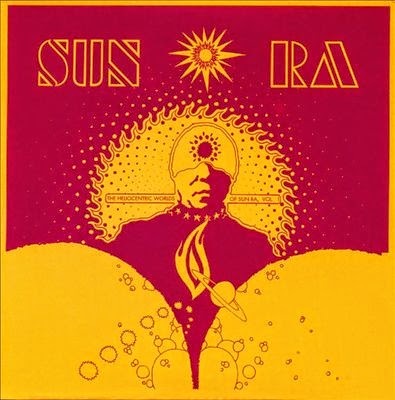 If you want to check out more Sun Ra music, I would suggest the albums Space Is the Place and Jazz in Silhouette . 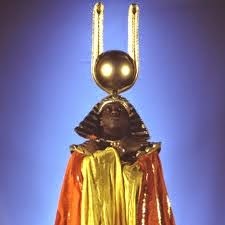 Whether Sun Ra is from outer space or not, his music is definitely out of this world!